My brother was recently held at gunpoint outside his home in Miami and forced to hand over his wallet, phone, wedding ring, and car. Granted there will always be thugs looking to score, I would like to use this opportunity to point out a growing problem in the United States, a problem created by central bankers that ultimately leads to unstable conditions at the core of society. Follow along as I map out how this makes its way from the top of the financial food chain all the way to the curb outside you home. The core mandate of the Federal Reserve Bank is to maintain the stability of the banking system. The system of banking used, called fractional reserve banking, relies on constant credit creation (or inflation) for its survival. When credit starts contracting (deflation) then bad things happen to banks. This is why the Fed has an explicitly stated inflation target (currently 2%) even though inflation causes increasing prices and is bad for savers. Lowering the interest rate, which causes money to become cheaper because banks can borrow for less. Using its power as the printing press to buy government bonds from banks that have purchased them from the US Treasury, causing banks to replace their Treasury Bills with cold hard cash printed out of thin air. The net result of both of these tactics is that banks accumulate a lot of cash that they didn’t previously have, for nearly no cost whatsoever. Once new cash has been loaned into existence by the Fed, banks are free to do with it what they wish. The televised theory is that the money will be lent out to average people in order to spur business creation, spending, etc. The reality is that whatever money isn’t simply hoarded by the banks is invested in such a way that yields as much profit as possible. Since interest rates in the US are held artificially low by the Fed, this means either loaning it to emerging markets where interest rates are higher, or by investing in more speculative instruments like the stock market. As part of this, a good amount of the money is loaned to businesses who then spend the money buying their own stock. What’s startling is that S&P 500 companies have been spending a near-totality of their profits on share buybacks rather than putting it towards capital expenditures such as better machines for increasing productivity. The importance of this cannot be overstated: people are not buying most stocks, companies are buying their own stocks using cheap loans resulting from artificially low interest rates. When money flows into the stock market it increases the demand of stocks, which increases the price (more money competing for the same number of shares). In the case of buybacks, it also reduces how many shares are available for the public, so you get a double-whammy of increasing demand plus decreasing supply. This is the reason the stock market has gone up in “value” so much since the Fed started stimulating the economy following the 2008 crash. Artificially low interest rates force people into riskier assets just to avoid the effects of inflation, which forces money into instruments like the stock market, which drives up their price and creates the illusion of true value. Since the majority of Americans do not invest in the stock market, and since the easy money created by the Fed flows into Wall Street, not Main Street, it’s only the upper 10% or so of the population that reaps the benefit of the increase in wealth. 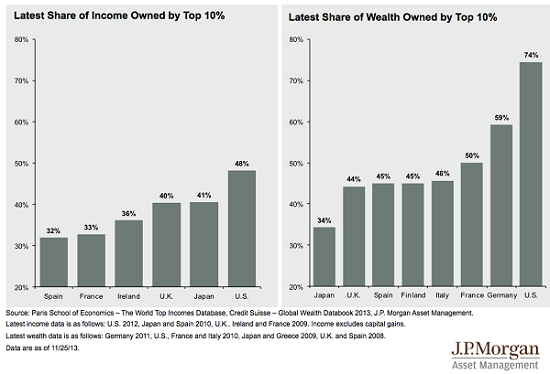 In fact, in recent years the top 10% of the population has gone from owning 48% of the nation’s wealth to owning 74%. It turns out the theory that wealth will “trickle down” to the masses is incorrect. Quite to the contrary, the money gets hoarded by the upper 10%. Make no mistake – this is where income inequality comes from: easy money from the Fed being handed over to the rich. You’ll see in a moment how the poor pays for this. Recall that the Fed has been pumping money into the system in order to protect banks from deflation by forcing inflation. The laws of supply and demand dictate that if there is more of something, each one is worth less. The same holds true for money. The more money is pumped into the system, the less each dollar is worth. What’s worse is that when the money supply is increased it’s only the first people who spend it that get the benefit. To use the example of the Ancient Greeks, when copper was mixed in with gold and silver coins the first people to spend them got a hell of a deal. However by the time the next person goes to spend the money, others have already begun to realize they’re not worth as much. The same holds true today. As we’ve seen above, the first place new money gets utilized is in financial instruments by the rich, who eventually sell those financial instruments at a profit to the next sucker. The cycle repeats, all while the rich keep ringing the cash register. Although the official government statistics (the CPI, consumer price index) show limited inflation, those that pay closer attention know that the government continuously modifies the basket of goods included in the index so as to mask the true story. Not only does this make people feel better but it also allows the government to avoid increasing social security payouts that are tied to CPI. So where is the inflation hiding? One answer is the stock market, but anybody who tracks their grocery, energy, and rent bills well knows the other half of the answer. Basically, inflation makes life more expensive! Lurking beneath the glitzy headlines of a soaring stock market lies the real economy. The real economy is not doing well, for too many reasons to go into here, and all the Fed “stimulus” has not been able to correct the problem. 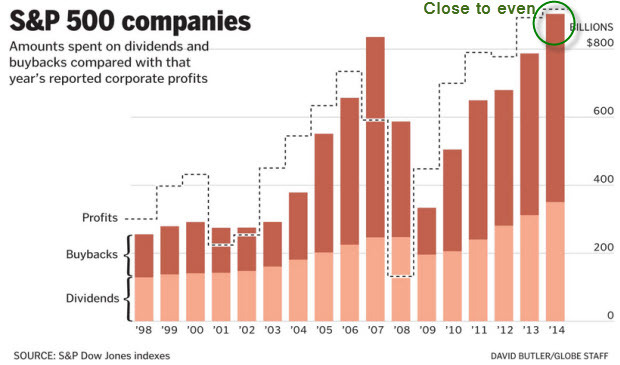 When the economy isn’t doing well, companies are forced to cut costs to remain profitable. Unfortunately the easiest place to cut costs is personnel. Again, the law of supply and demand dictate if there are fewer jobs available then people will be willing to take less pay in order to secure those jobs. The result of this is that average incomes start to drop. Now, the inflation described earlier isn’t a bad thing unless it outpaces the rise in household income. Unfortunately, median income in the US has not been keeping up. 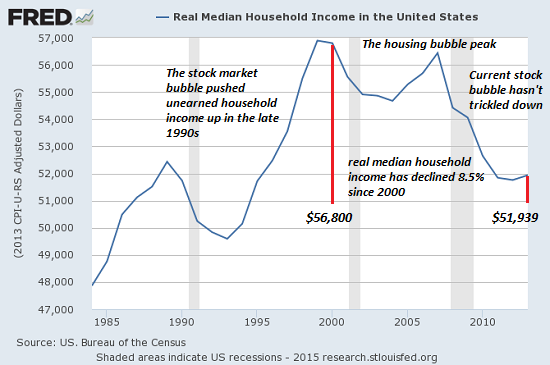 Real median income (income adjusted for official inflation) has declined by 8.5% since 2000. In fact, it is now about at the same level as it was in 1989. So, income has essentially gone down and the cost of living has gone up. Keep reading to see where this leads. But wait, it gets worse. When an increasing percentage of the population is forced to rent because they can’t afford to own, supply and demand rears its ugly head once again. Because more people are competing for rental properties, rental prices have absolutely skyrocketed in recent years. In fact, since 2010 the number of renters has increased by more than any other decade in history and rents have been soaring at 6% annually. This number may not sound like much, but it’s enough to double your rent in only 11 years’ time. Anybody who tracks their expenses over time, which unfortunately is not many people, can tell you that rents are a giant sink-hole of cash and it’s only getting worse. About one quarter of the population spends more than 50% of their income on rent, and almost a full half of the population spends over 30% on rent. 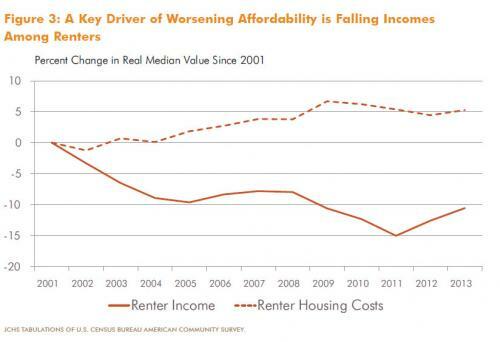 Herein lies the double-edged sword: decreasing income coupled with increasing rents. In extreme cases this eventually leads to an increase in downright homelessness, which may not be as far off as some people think. In Los Angeles, the number of homeless people has increased by 85% in just the past two years! This is the true cost of current monetary policy by central bankers: a gradual theft of purchasing power from the poor whereby wealth is transferred to the rich upper 10%. One recurring theme you see throughout history is that when the cost of basic living needs such as food and housing begins to exceed what people can afford, they get desperate. In a financial system that’s rigged to make the rich richer and the poor poorer, eventually there comes a tipping point. At first it’s an increase in theft and violence, but eventually that grows into riots and civil unrest, and in the most extreme of circumstances it leads to revolution. In the US, people will resort to crime more often as it becomes increasingly necessary to feed and shelter themselves. In fact, it has already started to move towards general civil unrest. Racial discrimination may be one example of the excuses people use for violence, but this is just a spark – a symptom of the disease. The underlying kindling is the real issue. The disease is income inequality. When society becomes polarized, bad things happen. Will politicians fix the problem? Highly unlikely. An interesting recent study shows that the type of people that make policy decisions are generally more interested in wealth efficiency more so than wealth equality. What I mean by this is that so long as the overall wealth in the nation goes up, it doesn’t make a difference to them if it is all coming from just one small slice of the population or if its coming from all people equally. Contrary to this, the majority of people would actually prefer wealth to go up equitably even if it means less overall. Unfortunately these people do not run our country. Violence – People will increasingly use violent means to support themselves and their families in the face of rising income inequality. Protests – Pissed off people getting will get angry at insert-your-reason-here. Increased Policing – The police will be used to “keep the peace” in areas affected by protests and riots. Financial Instability – Stock markets and other financial instruments can only be inflated for as long as people are willing to tolerate risk. Loss of Faith – People will eventually learn the ugly truth that the Fed and the politicians can’t fix the financial problems they’ve sewn. War and Conflict – Politicians will point the finger at somebody else (blame China!, blame terrorists!) and people will believe them. Unexpected Election Results – As people lose faith in government, they’ll increasingly turn to oddball fringe candidates to save the day. Deflation – The central banks will eventually lose the battle against deflation and prices of just about everything will plummet. Unemployment – With dropping prices, companies will be forced to use layoffs to maintain profitability. Sovereign Debt Crisis – Less employment will decrease tax revenues which will drive the government into even more debt. Bankruptcies – Less disposable income will cause companies to go out of business. Bank Failures – Collateral value will dry up, debts will become uncollectible, and banks will go out of business. Bail-Ins – Banks will confiscate depositors’ savings to pay down their debts, and millions will lose their savings. Helicopter Money – In a bid to save the system, the government may offer tax refunds or some other means of giving people money. Cash Hoarding – Cash will once again become king, and people will hoard it. Currency Devaluation – To help pay for debts, the currency will be intentionally devalued even more than it already has been. Currency Creation – As faith in money is lost, alternative currencies will spontaneously be created. Fiat Currency Failure – In the worst scenario, paper money will lose its worth and be replaced by a new system. There’s a fundamental reason that causes most things to happen in life. Although some people take on the thug life because they think it’s easier than getting a job or they like the power trip of holding someone at gunpoint, in most cases they lead that life because they feel they have no other choice. 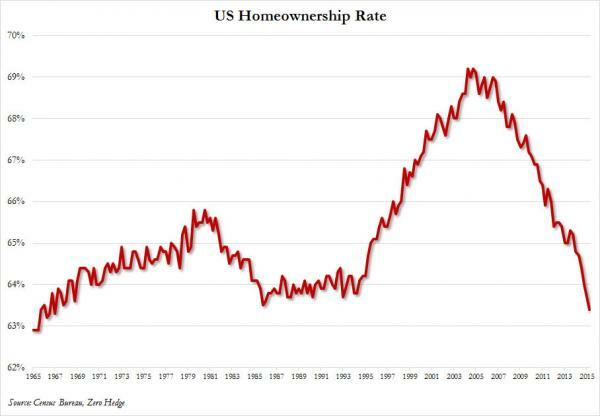 A huge driving cause of this is income inequality, which in recent years has been exasperated by flawed monetary policy that uses inflation to make the rich get richer, paid for by an increasing cost of living imposed on savers and poor people. A theft may be performed by a thug carrying a gun, but an even greater theft is committed daily by the people in the highest positions of power. The finger should be squarely pointed at them, and so long as they continue in their policies, the income divide will only get greater. Eventually a tipping point will be reached, and I fear this tipping point may be closer than many realize.